FLUMEN Fly Style Spinning is a brand of EXTRA Fishing Gear s.a.s.! ....Who is EXTRA Fishing Gear???? EXTRA FISHING GEAR was founded in 2015 following the meeting of two fishermen: Mauro Marsano, class 1980, and Ettore Miletto, class 1955. Ettore was immediately impressed by the technique of Mauro for effectiveness and elegance. And by how his lures were fascinating to the eyes of men... but to those of the trout even more! 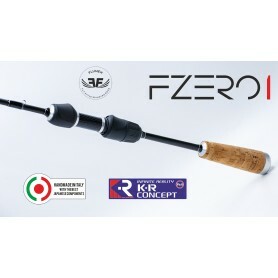 In short time, a project started to create a young and dynamic company with a well recognizable brand with the aim of becoming synonymous, in the circle of ultralight lovers, of high quality, creativity, environment friendliness, C&R practice, with a strong inspiration from fly fishing discipline. Soon after, the trademark FLUMEN Fly Style Spinning was registered , with the goal to take part in few months to the most important Italian Show in Vicenza. EXTRA Fishing Gear is therefore a young company, but it can rely on the passion and the long experience of its Partners. And of all its fans and followers! Mauro Marsano - with fishing in his veins, since his family was the owner of a thriving shop of fishing tackles in Genoa - has never sought an “easy win ” approach to fishing, looking instead for the challenges of difficult environments, such as the ones posed by the small trout streams of the Apennines. Observer, inquisitive and perfectionist, he continually refined his ultra-light technique. In the course of the years, he felt the need to make his own lures, his own rods, and to share his experiences with many fishermen with his same passion. Ettore Miletto has an experience of over forty years in spinning, which he always cultivated with passion, in addition to his commitments as manager of an industrial company - he is now retired. He had different fishing experiences, ranging from large rivers, lakes, alpine streams , with a preference for the last ones. Different stories, experiences and generations, with a common passion: spinning tecnique!